The infotainment system is the beating heart of a vehicle's technology. And the Hyundai Santa Fe's got a strong pulse. The system is displayed on a generous 7- or 8-inch touchscreen. And it's all kinds of responsive and fairly intuitive. 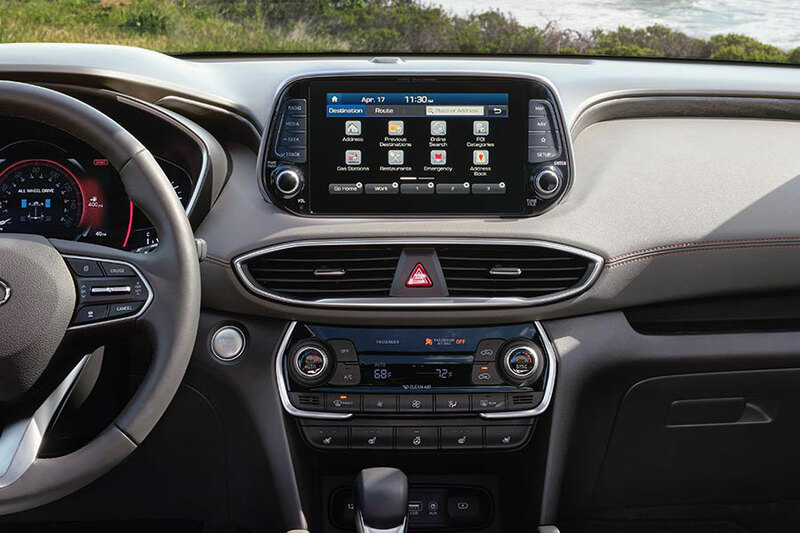 On top of that, the Hyundai Santa Fe comes with a wealth of standard tech features, like Android Auto and Apple Carplay for smartphone connectivity, Bluetooth, SiriusXM satellite radio, two USB ports, six-speaker audio system with CD player, and voice command. You can also grab navigation and real-time traffic and weather as additional options. The Honda Pilot's infotainment system skips a beat every now and then. It's slow in general and you'll find its layout and screens unintuitive. It starts as a small 5-inch touchscreen, though it comes up to 8-inches if you grab the option. Overall, you'll find even simple things, like changing the radio station, to be a chore. The Pilot has similar tech options to the Santa Fe, but Apple CarPlay and Android Auto do not come standard. Even at first glance, the Hyundai Santa Fe and the Honda Pilot look pretty different. Thanks to a styling refresh last year, the Santa Fe has an updated look. The Hyundai looks sleek in a class that all too often looks boxy. As one of the smallest midsize sport utility vehicles, the Santa Fe isn't tall or wide and only has average ground clearance. But that doesn't take away from this Hyundai's ferocity. The Santa Fe's front looks all glass, since it has a wide and tall windshield. And there's an optional panoramic sunroof to maximize the effect. The roof side rails for topside cargo makes the Hyundai look ready for business. On the other hand, the Honda Pilot looks like it aspires to be a minivan. The Pilot's boxy shape is a letdown, even though it's sleeker than it used to be. The Honda is wider and taller than the Hyundai but the Pilot has the same ground clearance, making this Honda look big without any bravado. In other words, less like a truck and, therefore, less adventurous. You can get extra chrome and a sunroof as options and there are eye-popping colors, but that doesn't change the tiresome shape. The 2018 Hyundai Santa Fe starts at just $24,950. If you prefer to get a third row, bumping up the seating to seven, you'll spend at least $30,850 instead. It tops out at the Limited Ultimate trim, which starts at $39,550. Any trim can be upgraded to all-wheel drive for $1,750. By comparison, the cheapest Honda is the Pilot LX, which starts at $30,900, or about the same price as the third-row Santa Fe. The Pilot tops off at Elite trim for a startling $47,470. Obviously, the Santa Fe will save you some money upfront without compromising tech, safety, or looks. If you absolutely need sporty driving and adult seating in the third row, the Pilot's biggest selling point, you might consider the Honda. All others should carefully weigh it against the 2018 Hyundai Santa Fe.